I began playing the violin at the age of eight. All of my family was musical in one way or another and I was lucky to have grown up playing the piano and learning traditional Scottish music at home. I became interested in composition and improvisation at an early age and joined my local musical theatre association as a dancer and singer. After two years study at the Junior Department of the Royal Scottish Academy of Music and Drama, Glasgow, I moved to London to study violin at the Guildhall School of Music and Drama (GSMD) graduating with a Bachelor of Music Honours degree. While studying at the GSMD I acted as a singing coach, composer and arranger for many drama student productions and taught myself the viola. At this time I was a founding member of a multi-media theatre group called Filter which won the Deutsche Bank Pyramid Award for new GSMD business ventures. Following membership of the National Youth Orchestra of Scotland, I was appointed leader of the Camerata Scotland orchestra and played with the National Musicians’ Symphony Orchestra in Liverpool and London. During the years 1996 – 2000, I was actively involved in the Mendelssohn on Mull Music Festival and was enlisted as a tutor of classical and folk violin for the Young Musicians of Mull. I received the Leonard Friedman Violin Award there in 1996. 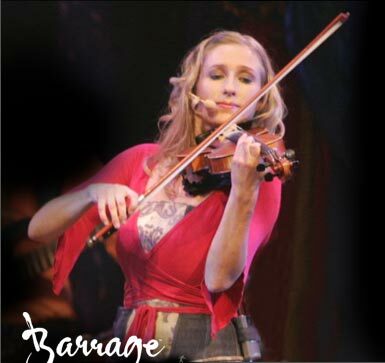 Before my involvement with Barrage I played professionally with the Scottish Bach Consort, and had my Concerto Grosso in G minor composition performed by them several times. I also spent time in London as a session player, arranger and singer for various pop artists, and played in ceilidh and rock bands and the big band IO, which performed regularly at Ronnie Scott’s jazz club. My other interests are horse riding, swimming, spicy food, and the study of synaesthesia. Being a member of Barrage gives me the opportunity to travel, which I also enjoy.